[PDF] Thinking about Higher Education | Free eBooks Download - EBOOKEE! Description: With higher education around the world in a period of extreme flux, this volume explores its underlying philosophy, a core element of the ongoing debate. 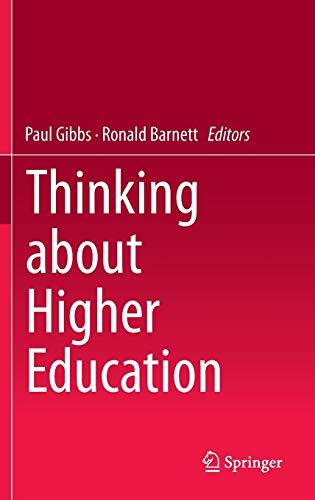 Offering a diverse range of perspectives from an international selection of renowned scholars of higher education, the book is full of imaginative insights that add up to a substantive contribution to the discussion. As universities attempt to adapt to a new environment characterized by stiff international competition, networked remote learning, burgeoning student numbers and comparative performance assessment, how we conceptualize the purpose and ethos of our higher learning institutions is more important than ever. This publication features a multitude of distinctive approaches that illuminate potential solutions to the complex issues universities must grapple with in these uncertain times. Rather than espousing a singular philosophical approach, the editors have assembled views from across the spectrum and from differing national contexts, representing a multidisciplinary response to the situation. This collection of papers aims thus to inspire fresh developments in the way we think about the complexities of and options available to, higher education. No comments for "[PDF] Thinking about Higher Education".